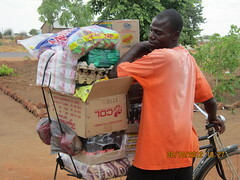 One of the joys of running ColaLife is the great emails and pictures you get. This one came from Excelente International Refrigeration in Mexico. Here it is with my reply (reproduced with permission). I’d love to ride one of these on the sponsored bike ride I am planning for the summer! I ran across your movement while searching out information on how to help impoverished countries and people of the world. What your doing sounds pretty amazing and you have a pretty good pace going on accomplishing it. It is not easy, my hat is off to you. We are Excelente International Refrigeration located in Mexico. We manufacture refrigerators for much of the worlds beverage and food industry. Freezers too. We are not a huge company, rather small actually, but extremely good in producing great quality, low priced, stylish refrigerators and freezers. 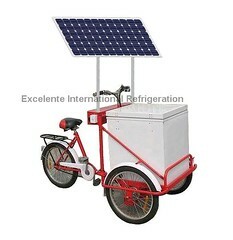 Not too long ago we created and started manufacturing Solar, and Rechargeable Battery Refrigerators and Freezers. 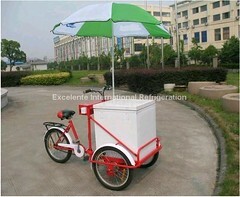 We also designed a mobile tricycle which the refrigerators/freezers can sit on to travel anywhere. They are currently being utilized on the streets of a few countries. Little by little the attention is growing about them. We were thinking though, that they could also be an incredible asset for countries that have no, little or expensive electricity. We read about medicines having no way of keeping cold. Entire villages with no way to refrigerate or freeze food. The list could go on and on as I’m sure you are aware of. We thought we’d try and help out by letting charitable entities, and people know about our NO ELECTRICITY REQUIRED REFRIGERATOR FREEZER…..NERRF! We named it The NERRF Project. Well we have encountered so much BS in these groups that it makes us sick that they can be called charities or pretend to be caring human beings. They are neither. In any event, we thought we’d send you this email and see if this is something you might like to make part of your goals? Or if you have people who might like to know about our refrigerators and freezers? Or anything you can think of…..? While our NERRF’s aren’t being used in remote areas now, (cities for selling beverages on the street), we’d be willing to design inside them a special compartment for your packages. So in every unit there would be specific room for bottles and specific room with your packages with branding. There are quite a few possibilities. Here are some pictures so you can see the NERRF Tricycle. It can also be used without the tricycle and the solar panel put on a pole, or the roof, or anywhere it can be in the sun. There is also a battery version where the battery is charged at night and then runs all day long. I know that they can be very helpful to so so many people who are in such need but we don’t have the expertise to make it happen. We think you do though……. It was great to get your email this morning. Aside from anything else, I don’t know if you know but I am a bit of a small wheeled cycle enthusiast and so I love your tricycle. We were looking for a tricycle just like that to ride around London to promote ColaLife last summer. Do you have any in London? I’m looking to do a ColaLife sponsored cycle ride across France in the summer and wonder if I could do it on one of your bikes? I have done quite a few long distance bike rides for charity in the past. My partner (in life and ColaLife), Jane, thinks you should change the name of your product though. So it’s not the NERRF, it’s the ‘Sola Cola Coola‘! I would like to feature your email and the pictures on the ColaLife blog if I may. 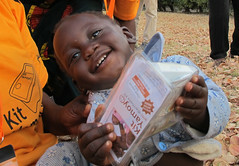 Could it be used for vaccine distribution, helping mantain the cold-chain?